S:CRAFT wood is kiln dried twice in a computer controlled drying facility. The wood is specifically dried to take into account the climate of the country to which the shutters will be exported. This is very important as these shutters are manufactured for installation in climates as varied as Alaska and Australia. By utilising these methods frame warping is greatly reduced. S:CRAFT use engineered stiles. The stiles are the side bars of the shutter panels. Rather than producing these as solid pieces they cut the wood into strips which are then bonded back together in opposing layers for greater strength. This has the effect of breaking the capillaries that run through wood through which moisture travels. This and the strength of the bonding agent ensures that shuttercraft fitted panels are unlikely to warp and will give you years of enjoyment. S:CRAFT use mortise and tenon joints between the rail and the stile. These are far stronger than dowel joints and will minimise movement between these elements. 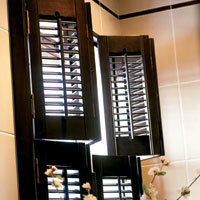 Movement means cracking in the paint or stain finish and this will spoil the aesthetic look of the shutters. Again just in case there is some movement they engineer the shuttercraft fitted panels with an additional grooved overlap that ensures any movement is handled by this expansion joint. S:CRAFT do not compromise on the thickness of our louvers as they believe thinner louvers, although less costly to produce, are much more susceptible to warping. A high quality, proprietary paint system developed specifically for shuttercraft plantation shutters. Cheaper shutter companies use cheaper paints and stains and utilise less coats. S:CRAFT use 6 coats of paint or stain. The final layer is a clear lacquer with UV additive to ensure that the shutters they supply are less susceptible to fading and yellowing. Only the highest quality marine grade stainless steel staples are used to attach S:CRAFT tilt rods to S:CRAFT shutters. In addition the tips of these staples are coated in a bonding agent to make sure they remain secure for years to come. S:CRAFT plantation shutters are supplied with a large choice of frames rather than attaching them to battens. Not only does this give our customer the choice of framing their window and utilising the style of frame to match their décor/ style but it also gives a much stronger and appropriate fit for ease of installation.